Just About Anything: GT: Oh yes, it's PINK!!! Your baby is so pretty! Pink suits her well. 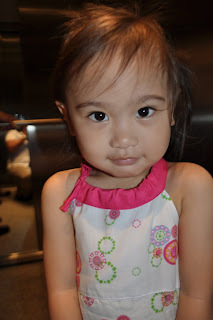 Wow, girly ang dating ng baby mo! 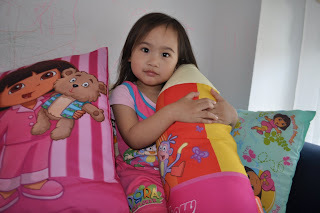 Especially love the pink Dora pillow. Fan din ang anak ko. 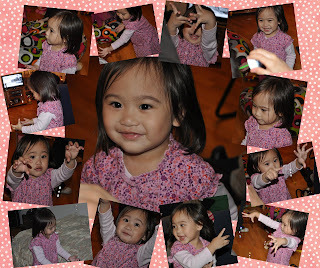 cute nman ng anak mo sis...and ang dami nyang little girly stuff..
your little angel really looks pretty in pink. 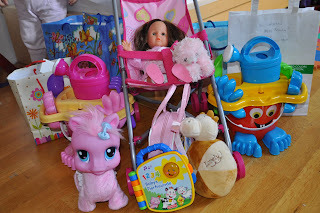 what a pretty pink stuff and your daughter was cute, my daughter loves pink as well and ofcourse the dora's pillow. well.. trying to make up for mommy's boyishness? lol! i LOVE that unicorn! it's so cute!